“Not launching can be painful, but not learning can be fatal.” That’s how Drew Houston, the founding CEO of Dropbox, describes his team’s approach. Dropbox, if you haven’t heard of them, does file-sharing in the cloud. They give users access to the same files on all devices, regardless of where they are used. After interviewing their geeky friends in MIT dorm rooms, the Dropbox founders wanted “write once, read anywhere” file management to apply to all files. Not just a software developer’s source code. They started working on developing a working prototype to solve their own problem. When Dropbox launched, a number of cloud storage competitors with deep pockets already existed: Google Drive, iCloud, AWS, Carbonite, to name a few. To get their product off the ground, Dropbox had to be different. And simple to understand. If we build it, how will we acquire traffic? Who exactly will be interested? Are they interested enough to establish a relationship with us? What kind of conversion rates do we get? Result: Pass. The team was able to acquire traffic that converted based on a description on a landing page. At the same time, they were building prototypes to assess the technical viability of the product idea. As this initial market test proved that some pent up demand existed, the team dug further. Step Back: This test established baselines, which could then be used to explore the product presentation further. Also, it helped them reach out and establish contact with their market, independently of their immediate personal network, thus providing a slightly more unbiased signal. Also, using such a page potentially allowed them to test a path to market, to locate their most rabid fans. As part of their application to YCombinator, Dropbox really wanted to get Paul Graham’s attention. So they created a video aimed at attracting early adopters. The goal was to explain the product concept as a story. The core differentiator (big idea as they call it) was “write once, read anywhere”. Make changes to any copy, and all copies are updated with the same changes. Success Criteria: signups > X or conversion rate > X% (established previously) — more accurately in Dropbox’s case it was to get accepted into the YCombinator accelerator program. Result: Pass. Built list of around 5,000 interested prospects. The problem description resonated strongly with their targeted early adopter audience. Step Back: Moving to a video format helped get across the product’s story more effectively. This made it more accessible to everyone. In and of itself, an explainer video is just a change in format–similar to how a bestselling book is treated as a candidate to become a blockbuster movie. Ultimately, a landing page that tests demand much get across the story well. The medium for telling that story is secondary to the relevance and quality of that story to the target audience. As Dropbox’s initial target audience was quite technical, this explanation mapped to a number of tools and behaviors they already knew from software development. And they were more than happy to run with the write once, read anywhere concept. Arguably, this niche perceived other cloud storage as defective because it didn’t support this kind of functionality. As a result, they needed little convincing and persuasion to hop on board. 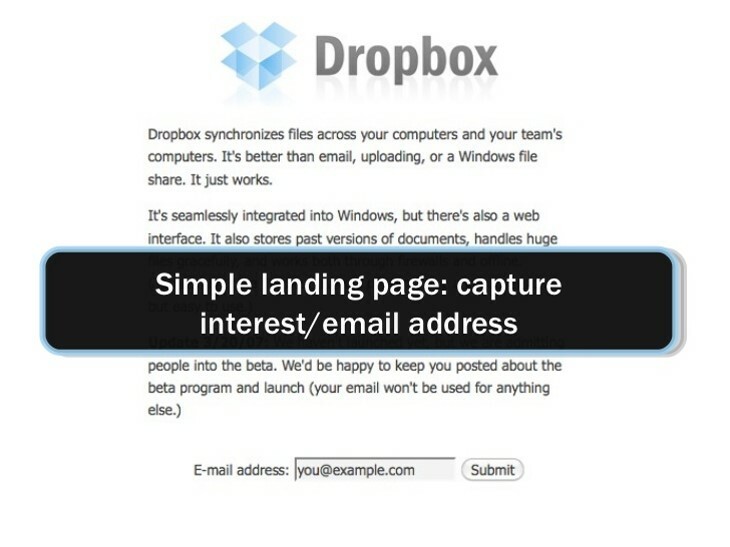 Dropbox experimented with using paid acquisition on a landing page. This is not an early-stage landing page MVP test. It’s an attempt to figure out what will grow the company, not whether the product idea is attractive. They hired an experienced search engine marketer, who went out and made landing pages. On those pages, they hid the free option, replacing it with a free time-limited trial. AdWords interface is showing incorrect campaign conversation numbers. Difference of numbers are computed here. The most obvious keywords were expensive. Hiding the free option was shady, confusing and buggy. 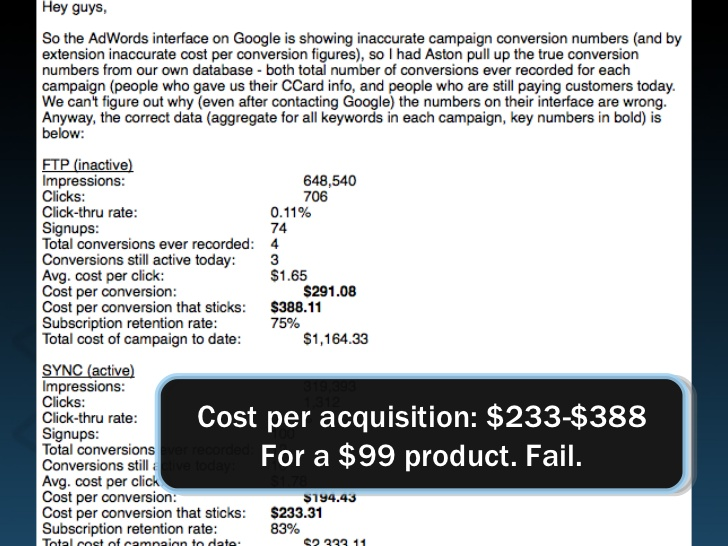 The conversion numbers on Google’s dashboard were inaccurate. Result: Fail. As their cost of acquisition at the time was at least $233 for a $99 product, the experiment to test paid acquisition as a profitable traffic source failed. Based on the economics of paid search, pay-per-click didn’t look like a viable growth strategy for Dropbox. Step back: Even though PPC as a source of traffic didn’t work for them, it solidified their confidence in their ability to retain customers. If people bought, their subscription retention rate was over 75%. In short, they had a great product their community loved, and they had product market fit. 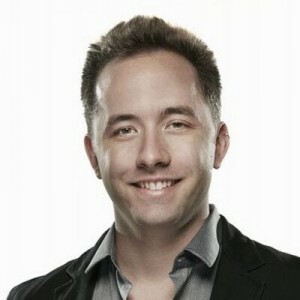 In Drew Houston’s words, this meant that “product-market fit cures the many sins of management.” After this idea failed, Dropbox created a famous explainer video which went viral, thus proving that a viral engine of growth was better for them. Result: Pass. Simple and concise converts better, as does having a clear call-to-action for the next step. Step back: This test type is taken out of the traditional toolbox of conversion rate optimization (CRO). The idea is clear to the founders. They want to communicate it as concisely and effectively as possible to their target audience. Even if they move to a different traffic source later (as Dropbox did), a clear and powerful value proposition ensures a high conversion rate for all further marketing efforts, including free traffic sources. Moving too early into this kind of testing can be a type of premature optimization. The key tactic Dropbox used was to to test both market and technical viability simultaneously. In addition, they did a number of smaller tests. Each test checked a much smaller piece of the bigger puzzle. This required them to break down the overall vision into discrete tests which they built and ran. 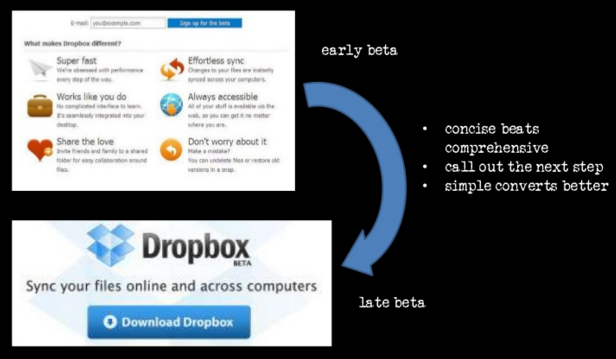 By running a series of experiments, Dropbox stayed with the ethos of MVP=experiment. Each cycle around the Build, Measure, Learn loop gave them greater insight. Each step they took tested something new about their target market and their product. As a result the product evolved very quickly, because the team gathered actionable yet counter-intuitive data. 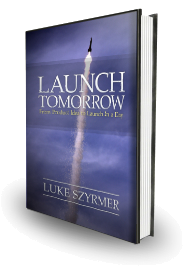 This helped them build a strong USP (unique selling proposition) in a crowded marketplace using technology that was theoretically possible but unproven. There is a lot more to a minimum viable product than just a beta software release. This post aims to make that clearer. Riemer on Story Structure from Tara Loomis on Vimeo.